have gone on this rock, but as a best bet for the newcomer, it should be avoided! a subsequent visit with Dave Campbell they put up five routes in an afternoon. Hollingsworth added an impressive string of routes. especially on Echo wall, with good landings on soft sand. convince yourself of that!). Slings are needed for runners around trees. would be nice to see this ratio of bolts to natural pro. remain. 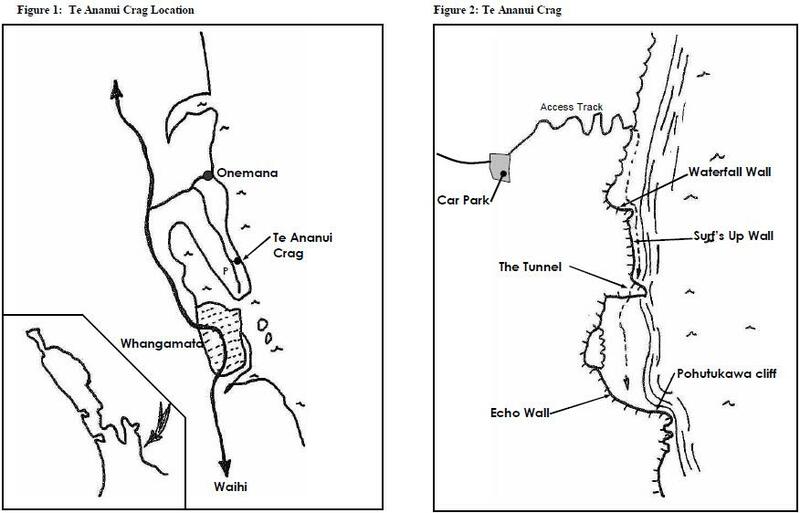 Te Ananui is 12 km by road from Whangamata on the Coromandel Peninsula. in. There is no fresh water at the beach for most of the year. juts out into the sea with prominent cracklines, and a cave. This is Pohutukawa cliff. www.freeclimb.co.nz. hosted by Cliff Ellery, written by Dave Campbell.